If convicted, section 500 of the IPC entails a simple imprisonment for two years or fine or both. 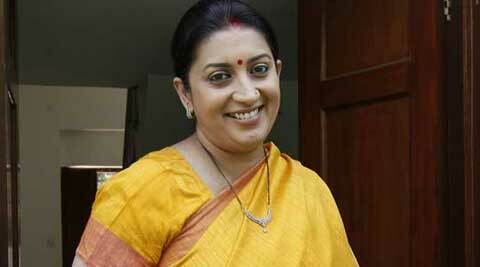 Smriti Irani leader had made “defamatory and scurrilous comments” against Sanjay Nirupam during a TV debate. A Delhi court today fixed February 28 next year for hearing a criminal defamation complaint filed by Congress leader Sanjay Nirupam against Union Human Resource Development (HRD) Minister Smriti Irani. Metropolitan Magistrate Dheeraj Mittal, who had earlier summoned Irani as an accused asking her to appear today, was on leave and the matter was posted for the next date. Nirupam, a former Congress MP, had filed the complaint against Irani alleging that on December 20, 2012, when assembly election results of Gujarat were announced, the BJP leader had made “defamatory and scurrilous comments” against him during a TV debate. “That the accused (Irani), a Member of Parliament of the BJP defamed the complainant by making direct aspersions on the character of the complainant (Nirupam),” the complaint had said. “The complainant’s (Nirupam) reputation of excellence and integrity has been dented due to the scurrilous, defamatory and derogatory comments made by accused during the said debate,” it had alleged. Nirupam had said that he had sent a legal notice to Irani through his counsel on July 25 last year asking her to tender an “unconditional public apology” for allegedly making defamatory comments against him but she did not reply to it. Earlier, Irani had also filed a defamation complaint against Nirupam for allegedly defaming her during the same debate on the private news channel and the court had framed charges against him for allegedly using derogatory and indecent language against her. On Irani’s complaint, the court had put Nirupam on trial under sections 500 (defamation) and 509 (uttering any word or making any gesture intended to insult the modesty of a woman) of the IPC. If convicted, section 500 of the IPC entails a simple imprisonment for two years or fine or both. Section 509 of IPC carries a simple jail term of one year or fine or both. Irani, a Rajya Sabha member, had claimed in her complaint that Nirupam had allegedly questioned her credentials to analyse poll results given her background as a TV actress.